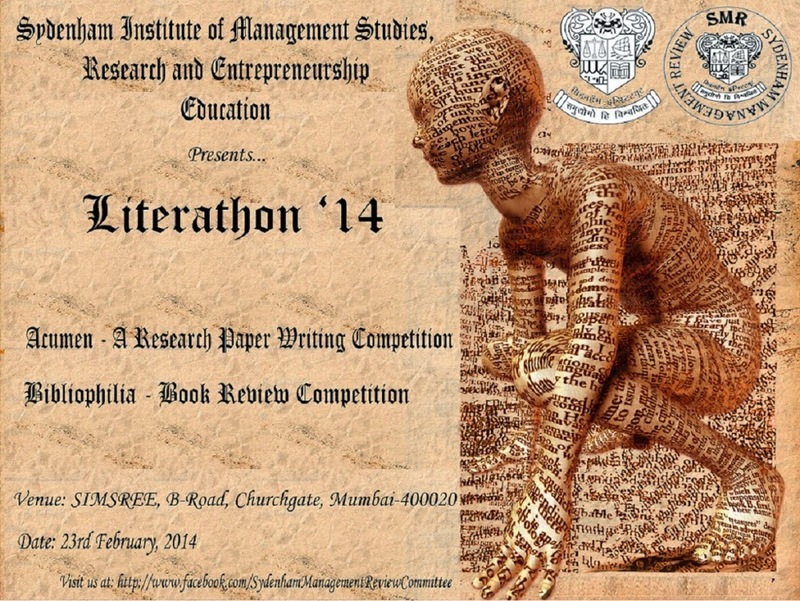 Literathon is the flagship literature event of SIMSREE, organized by Sydenham Management Review (SMR) Committee. Literathon’14, sponsored by LeadstartTM publishing, was organized on 23rd February, 2014 in the Sydenham Management Excellence Center at SIMSREE. 1. Acumen: Acumen is a research paper writing competition which aims at providing a platform for young management students to present their ideas and views to the business community. 2. Bibliophilia: A book review competition which gives young management students a way to showcase how a thought provoking book has imprinted their minds. Inauguration ceremony of Literathon started at sharp 9:00 AM in a packed auditorium, first with the national anthem. It was followed by the traditional lighting of the lamp by our dignitaries Mr. Suresh Nimbalkar - Senior Vice President, Hansa Research, Mr. Ninad Karpe – CEO, Aptech and Professor Agnello Menezes – Economics, St. Xaviers College, who were also the judges of Acumen. The inauguration ceremony ended with a short video showing a glimpse of the activities conducted at SIMSREE to the audience. Acumen was the first event. The finalists for Acumen were from JBIMS, SIMS, IIM-I, IIM-L and NMIMS. Each team tried to showcase their research to the esteemed jury. The research papers covered different fields of management viz. Marketing, Finance, Operations and HR. The presentations were followed by a Q&A round, where the jury not only asked insightful questions, but also suggested future avenues to the teams for their research. Finally the team from SIMS (Mr. Atish Bakhru and Ms. Shivani Sharan) emerged victorious, their topic of research being ‘Customer Perception Analogy for In-store retail vs. Online Retail of same electronic company’. Team from JBIMS (Mr. Manish Tewani and Ms. Ajita Ranade) finished a close second with their paper ‘Revamping the Sales and Marketing Strategy for the Indian Pharmaceutical Industry’. The dignitaries were especially pleased by the effort put in by the students and also advised them to use such analytical skills in all walks of life. The jury then shared their experience and feedback about the papers and the event with the audience. Acumen ended with the prize distribution to the winners which included cash prizes and books from our sponsors. Post-lunch, Bibliophilia started with the same pomp and fervor as Acumen. The judges for Bibliophilia were Dr. Ambi Parameswaram - Advisor and Former CEO, DraftFCB Ulka, Ms. Anjali Kriplani – Author “Never Say Never” and Prof. Leslie Rebello – Director at LRMEI & L.R. Associates. Teams for Bibliophilia were from institutes like SIMS, SIMSR, PUMBA and SIMSREE. After the presentation and a grilling Q&A Round the winner was Ms. Harsha Dharmaskar, who reviewed the book ‘1984’ by George Orwell and the runner-up was Mr. Ayush Samantroy, who reviewed ‘For God’s Sake’ by Dr. Ambi Parameswaram, both from SIMSREE. The jury was impressed by the details with which the books were reviewed and the intuitive way in which various management concepts were explained citing examples through the books. With the feedback from panelists and prize distribution to the winners, Bibliophilia and in turn Literathon’14 signed off a successful completion of its 3rd year and with plans of becoming bigger and better in the form of Literathon’15.